WHO are the people of St. Joan of Arc? St. Joan of Arc's leadership consists of Father Aaron Wessman, Pastor, and Julian Crespo, Pastoral Coordinator. As of 2018, there are 200 active, registered members of St. Joan's. Eighty-seven percent are Latino. Many of these parishioners travel close to an hour from several surrounding counties to celebrate Mass. The parish also has an outreach program for migrant workers who are employed by a coastal seafood factory shelling crabs and oysters in season. Since they do not have the means to travel, members of St. Joan’s bring a Catholic presence to these folks by traveling over an hour to offer Bible study and Liturgy service. WHAT is a Sister Parish? In 2011, OLA "adopted" St. Joan of Arc--a small mission parish--as it's "sister". Since then, our parish has been building a relationship of support with them through prayer, donations, and group visits. It is through this relationship that we hope to meet the goals of nurturing this Catholic mission parish while they grow more financially established. St. Joan's will be returned to the care of their diocese when they no longer need the support of the Glenmary Missionaries (see below) and OLA's assistance. WHERE is St. Joan of Arc Parish? Glenmary Home Missioners (GHM) include priests, brothers, and coworkers who are dedicated to establishing a Catholic presence in rural areas and small towns of the United States. The GHM Catholic society was founded in 1939 by Father William Howard Bishop, a priest of the Archdiocese of Baltimore, who saw the need to bring the Catholic Church to people in the United States where the Church is not effectively present. Since 1798, St. Joan’s was declared a mission church. In 1974, the current church was built with the first Mass in the new building offered on June 15, 1975. The church contained a small kitchen, sacristy, and worship space which was easily transformed into a gathering space for church functions. In 1990, a Pastoral Administrator was assigned to the Parish by the diocese. In 2004, the Diocese of Raleigh requested the presence of Glenmary in this area of North Carolina and a priest was provided to lead the congregation. It was an area with few Catholics, a high percentage of unchurched and a high percentage of residents living in poverty. In 2005 when Glenmary officially took on the responsibility for St. Joan’s, there were 140 Catholics in the county. In 2011 they had 226 registered members with 66 families. Forty-four were Hispanic and the balance was mostly retired couples. In 2018, there were 200 active, registered members with 53 families actively attending church. Eighty-seven percent of their members are from Latin America. The majority are from Mexico, but they also have members from Honduras, Columbia, Peru and Guatemala with one Asian and one African American family. Their remaining members are Anglo American. Father Aaron Wessman conducts one Mass each weekend in English and the other Mass in Spanish. Many in the Latino community drive 40-60 minutes to celebrate with their parish family at St. Joan’s. Seventy percent of their members are actually from other counties. In 2010, a new parish center was built. A significant part of the building was completed by parishioners. In addition to worship and gathering space, it currently serves as classrooms for faith formation, adult education and social events for the parishioners. 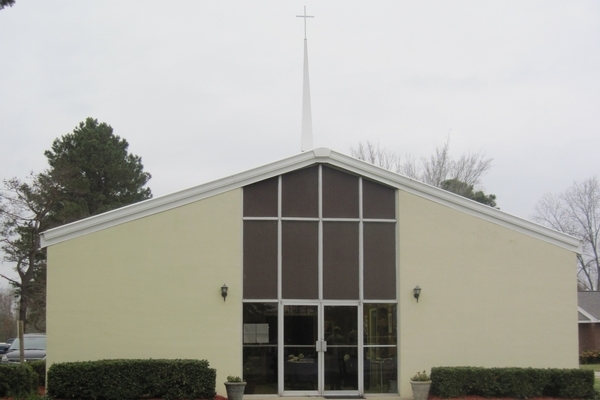 The idea to support a mission church was generated in an OLA Small Christian Community. After much discussion it was decided that a mission outreach was their goal. Research led the parish to Glenmary Missioners in 2010. After approval by the Social Justice Committee, Parish Council and Parish staff, the covenant with St. Joan’s moved forward. On May 21, 2011, our church signed a covenant agreement with St. Joan of Arc. The covenant relationship is one of mutual support and prayer, sharing our faith, and striving to maintain an ongoing dialogue with each other. In addition, Our Lady of the Assumption pledged a yearly financial support of $2400 per year. This money goes directly to their operating budget. Glenmary covers the cost of the outreach ministries, religious education classes, Mass supplies, pastoral associate salary, building maintenance, and other community needs. Weekly envelopes by the parishioners provide the balance of their budget. Since 2011 OLA parish members have traveled to St. Joan’s three times to work with their parishioners on projects around the church. The projects included painting, landscaping, electrical work, minor building projects and an extended playground area. It is an 18 hour drive to Plymouth so it is a challenge to make the trip every year. Each year, a parish from Baltimore provides all that is needed to run Vacation Bible School for St. Joan’s. Typically they have between 50-65 children in attendance. On the weekend of August 15, 2018, OLA Parish's yearly special collection for our sister parish raised more than our goal of $2400. This money will be used to provide clothes, food, Bible class, special retreats for the 40-50 adult migrant workers, faith formation for 41 parish children, and financial assistance for parish families over the next year. OLA is committed to this financial support for another 2 years. It is unlikely that St. Joan’s will be handed over to the diocese in the near future (a minimum of another 3 years of Glenmary presence is likely). Glenmary will not return the parish to the care of the diocese until they are sure that the community can continue without the financial subsidy provided by Glenmary and the assistance of us, their sister parish. In December, the coastal migrant crab workers returned to their families and homes in Mexico as the seafood plants close for the winter. Workers will return in May/June to work again for a six-month stint in the fish processing facility. Other St. Joan's events of interest are their Novena to Our Lady of Guadeloupe which starts on December 4th and it runs until her feast day on December 12 and a Christmas angel tree--much like OLA's--for children in the parish who have the greatest needs, usually clothing. Fr. John Brown, a visiting Glenmary priest, plays the guitar at Mass. St. Joan’s embarked on a new fundraiser last Fall bringing many local people to their first antique car show.